RETIRE IN STYLE BLOG: Arizona Press Women: Hot After All These Years! Arizona Press Women: Hot After All These Years! Arizona Press Women and me! When a group of southern Arizona's Press Women gather at a table to discuss what is on their mind, you have a group of "hot" Baja Babes. The name says it all and you can get a feel for their skill at writing a "headline" that grabs you attention. I sat at the table with retired freelance writers, newspaper editors and magazine writers along with working columnists and even a communications director for a local hospital. The majority of these women were beyond retirement but don't let that put you off. Most of these women had minds like steel traps and a curiosity that would not stop. Blogging falls outside all those paying jobs that keep writers employed so I was a bit of an odd ball in the group. One retired couple stated that they both had come from a newspaper families. Another talked about a book she had written on ghosts in Tucson that was out of print. I love to talk about ghosts so that interested me. The lady that sat next to me was 90+ and very blind. But she gave me a lesson on ideas for things to write. She pointed to a picture on the wall and said she could write a story about it in a heart beat. So naturally the question asked of me was "What do you do?" When I told them I earned a little money at blogging/writing the obvious question was how do you do that? While most were computer savvy, they had not embraced writing for a blog as a way to be employed. Writers like me still need to prove what we can do in a group like this. Times have changed and these women had a hand in it. They talked about their name, "Baja Babes". When they chose the name several years ago, a member had objected on the basis that a "babe" was a fallen woman. The lady at the other end of the table observed; "After all, we are liberated women and we can call ourselves anything we want." For me, that answer resonated on so many levels. We were the generation that saw the ERA amendment go down to defeat but embraced the hope that we could be seen as equal without having to become a man. I knew that newswomen and female writers had influenced the thinkers of that day. I left that luncheon with a sense of awe. Retirement, age, loss of sight and hearing did not keep these people away. They still felt the creative juices and each one was working on one project or another. They paid for my lunch and invited me to join their group. The Press Women organization does has some requirements for membership. I feel a little timid about applying. I think you can see why. Note: The Arizona Press Women have just published a anthology. 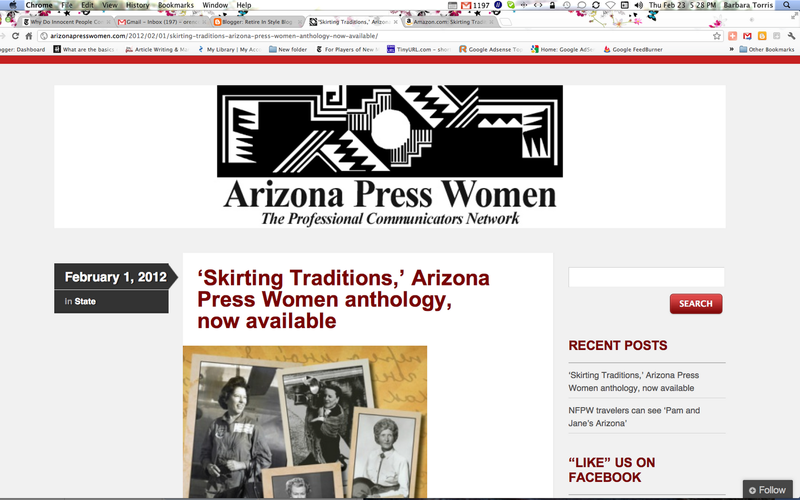 Skirting Traditions: Arizona Women Writers and Journalists was published in honor of Arizona's centennial. It was written by active members of the organization from around the state and at least one was sitting at that table with me. I will read the book. Eleanor Mattausch attended our luncheon and is one of the women featured in the book. She said she is finally retired from her beloved Oracle, the monthly paper for Pinal County, and can now read all those books she has wanted to read. I think she is 80. Skirting Traditions is a history book, presented as a collection of short stories, moving forward from the beginning of statehood in 1912 to the modern day. Each story chronicles the life of a woman writer or journalist in Arizona who made a significant contribution to the history of the state, beginning with Sharlot Hall, who campaigned to have Arizona admitted to the Union as a separate state, and ending with Jana Bommersbach and Pam Knight Stevenson. Skirting Tradition is available on Amazon.